123Landlord makes it unbelievably easy to manage all of your tenants & properties, collect payments and track rent due, and keep everything accessible any time, from any computer or device! Store everything about your tenants, leases, & properties in one place. Keep track of contact history, lease expirations & move-outs, and a lot more. Collect recurring payments and late fees, print or email invoices and receipts, and track income & expenses in an easy to use ledger. Keep an eye on maintenance and repair issues for your properties. Create work orders and send them directly to your vendors and contractors. Create an unlimited number of documents, or choose from pre-built templates. Personalize with insertable fields from the database. Accounting and rent roll, payment histories, full statements, invoices, receipts, work order details, and much more. Export to Excel, Word, and PDF. Run criminal background & eviction searches, and verify identity & credit - our tenant screening provider is completely integrated with 123Landlord. Tenants can log in securely and view their balance & payment history, and can send you payments via credit card or e-check (ACH) - no more paper chasing! A comprehensive help system, live support, user manual, and how-to blog posts. Over 55 major upgrades with user-inspired features since 2011! "Nothing Seemed to Suit Me ... Until I Tried 123Landlord"
"I looked for over a year for landlord software and tried several other products. Nothing seemed to suit me or fit all my needs, until I tried 123Landlord. We work as a team in our office and it is perfect for our needs. Our clients who we've shared reports with also appreciate the bookkeeping and ease of use." 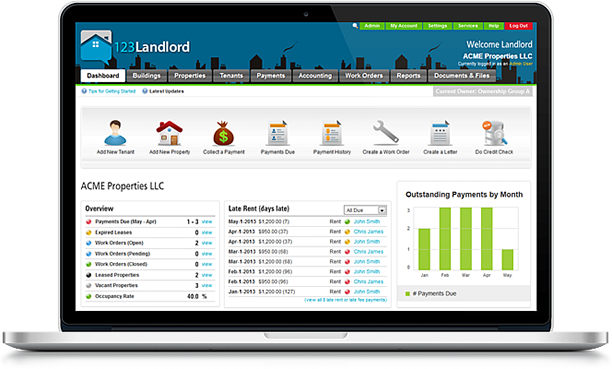 Affordable & Easy To Use - Rental Property Management Software For Everyone! "The Customer Service is Unparalleled"
"123Landlord is simple and intuitive, yet robust enough to handle all property management needs. Best of all, the customer service is unparalleled." "Reasonable, Reliable, Online Property Management Software"
"Just wanted to express our thanks for the time you spent with us and for being so helpful. We appreciate all the modifications that you are doing. It’s nice in today’s day and age to find a company so willing to work with you. We hope that your business prospers and that we’ll continue to have a long professional relationship. We will do our best to let Landlords know there’s a place they can go for reasonable, reliable online property management software."